On the shores of an Aegean island full of butterflies, on a sparkling beach with clear waters: there lies the Electra Palace Rhodes, bright and colorful, a modern resort with clean lines, made for you to have the best summer holidays of your life. Bright and colorful: such will be your days, and your nights, here! Start your day with a hearty breakfast in the Electra's Restaurant, our main restaurant. Enjoy the magnificent views of the Aegean – and plan your day: will you be spending it all at the beach or by the big central pool? How about a tennis match at the resort’s court, or maybe a friendly game of volleyball or basketball? The kids are going to love it! After lunch you can enjoy a refreshing nap in your spacious, cool room, or maybe read some more of that exciting novel you found at the hotel’s reading room. There are also outdoor yoga classes and spa and massage treatments, for you to completely relax while on vacation. It’s your “me” time – the children are well taken care of at the kids’ club, playing fun games and learning new things. As the evening approaches, you start to think about dinner: Chinese, or Italian? Don’t forget to check out tonight’s menu at the Electra's Restaurant too – its variety is so tempting! After dinner, how about a drink at the lounge bar? Or, how about asking for our childcare services and taking a long romantic walk with your significant other on the moonlit beach? Fresh and airy, the standard rooms in our Electra Palace Rhodes hotel will make you relax the minute you walk through the door. Featuring a private balcony with beautiful views of the Aegean or cool garden and pool views, they are modern and crisp and fully equipped with all the amenities you need to unwind and enjoy your holidays! Featuring great views to the Pool or to the Garden or to the Sea, the superior rooms in our Electra Palace Rhodes hotel will instantly win your heart with their cool colors, deluxe furniture and exceptional amenities. Able to host up to four people, these spacious junior suites are ideal for the whole family! With their own living room and a private balcony, our Electra Palace Rhodes hotel suites feature garden or pool views and offer all the amenities necessary for a fun family holiday for all! Able to host up to four people, these spacious family suites are ideal for the whole family! With their own living room with sliding door and a private balcony, our Electra Palace Rhodes hotel suites feature garden or pool views and offer all the amenities necessary for a fun family holiday for all! 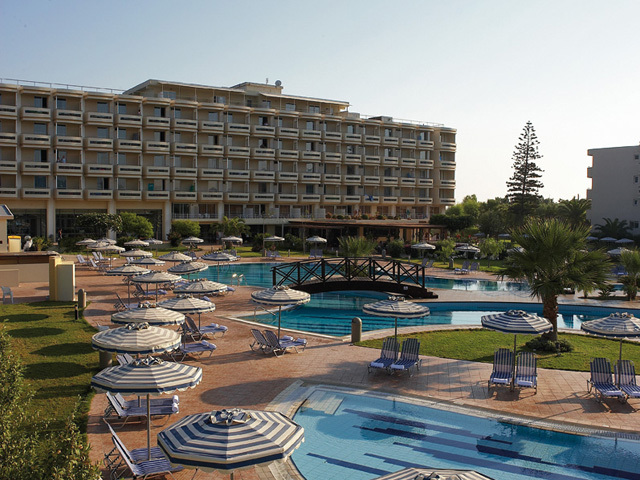 Being a family summer resort first and foremost, the Electra Palace in Rhodes includes superior family suites that are designed with the needs of families in mind. Featuring separate sleeping and living room quarters, they are modern and spacious and can effortlessly host a family of four without any compromise in comfort. With expansive views of the Aegean, modern, vibrant décor and ample space, the Electra Palace Rhodes’ deluxe sea front suites are the ideal resort accommodation for a delightful, laid-back summer holiday. Featuring a private balcony with sea views, a separate living room area with a dining table and, of course, the celebrated Electra hospitality, they are waiting to host your most perfect greek vacation ever! Yoga sessions (on the beach). Welcome fruit basket for Residence and Sea Breeze Junior Suites guests. International Restaurant. Show cooking and buffet for breakfast, lunch and dinner served with cosmopolitan flair in the non smoking restaurant. The hotel also caters, upon request, for clients with particular dietary needs. Italian Restaurant. Red touches for a casual lunch or dinner. Service hours from 13.00pm to 15.00pm and from 19.00pm to 23.00pm. Chinese Restaurant. Exotic smells and spices for a candlelight dinner under the stars. Bookings essential. Operation from 19.30 to 22.30. Lounge Bar. Chic atmosphere in soft music surroundings. Operating from 16.30pm to 24.00pm. Pool Bar. The coolest hotspot for carefree sunbathing. In operation from 10.00am to 16.00pm. Local and Branded drinks and cocktails are offered in all the bars till midnight. Room Facilities. Tea and coffee making facilities, bath robes, slippers, toiletries, safe-deposit box, hair dryer, satellite TV and music channels,24 hour air conditioning and mini bar with mineral water, soft drinks, beers and snacks once upon arrival. DVD for Residence and Sea Breeze junior suites. Late Buffet Breakfast available from 10.15am to 12.00am by The Pool Bar. Traditional Afternoon Tea. Served daily at our Lounge Bar from 16.30pm to 17.30pm. Picnics (isothermal lunch baskets in place of lunch or dinner). Wi-Fi (charge) at hotel and quiet zone. Library ,card tables and wide TV screen. Beach Towels at the pool and at the beach. Pool and Beach waiter service. Open air whirl pool. Available 10.00-16.30. Meet Me. Teenagers Club with internet access& internet games(charge) Functioning from 16.00 to 22.00 daily. Mini Club. For children 5 to 10 years old supervised by trained personnel. Sports. Yoga sessions daily, floodlit tennis court, Basket-ball, volley- ball and beach volley court. Cosmopolitan and hip, the main restaurant of our Rhodes hotel, the Electra's Restaurant, is truly grand with its Art Deco décor, 400 person capacity hall, impressive buffets and Aegean views. From 07:30 in the morning until 21:00 in the evening, the Electra's Restaurant at Electra Palace Rhodes serves delicious meals for all tastes and ages. Start your day with a hearty American style buffet breakfast, then come check out our extensive lunch and dinner suggestions: featuring a wide variety of international cuisine dishes, it also caters for vegetarians, has special kids’ menus and can accommodate special dietary needs upon request. Special theme nights and show cooking events complete the Electra's experience, making it a truly enjoyable restaurant you will be frequenting often, while staying with us! Classic Italian flavors “al fresco”: right by the huge pool, Al Convento restaurant draws inspiration from the island’s 20th century history to offer you a delicious meal: Antipasti and salads, fresh pasta and pizza, and of course Italian deserts make up this Rhodes restaurant’s mouthwatering a la carte menu, all prepared using the freshest of ingredients for your culinary enjoyment at lunch or dinner. Spice up your greek holiday with a taste of the exotic: serving a candlelit dinner under the stars, A La Chinoise restaurant is ideal for a romantic dinner or a celebration under the warm summer night skies. By the pebble pond, enticing aromas and flavors, contrasting textures and oriental recipes, all invite you to a culinary journey that starts form our Rhodes restaurant, and leads to faraway lands. Espressos, lattes, cappuccinos, tea bar, freshly made desserts and delicious ice creams, served all day on our brand new sweet spot.Late breakfast and afternoon tea are also served here. Right by the big freeform pool, the H20 Pool Bar at our Rhodes hotel is packed with fun: serving coffee, refreshments, snacks and drinks, it is the perfect spot for sunbathing under the bright Greek sun, relaxing under the umbrellas, or catching up on your summer reading. Offering relaxing views of the gardens and the Aegean, the cool and expansive all-day Philoxenia Lobby Bar at our Rhodes hotel serves refreshments and drinks throughout the day. Enjoy your mid-day coffee on its comfortable chairs and sofas, or have an aperitif before dinner. In its marble tiled hall, escape the summer heat with a cold juice. Or, have one last late night drink before turning in, letting the memories of the day sink in! Chic, laid-back, stylish: the Electra Palace Rhodes Lounge Bar is the place to be from late afternoon until midnight. Cool tunes, cooler cocktails and the coolest people can be found here, making this the perfect hang out spot before or after dinner!